USAfrica names Anambra's Obiano Nigeria’s Governor of the Year. 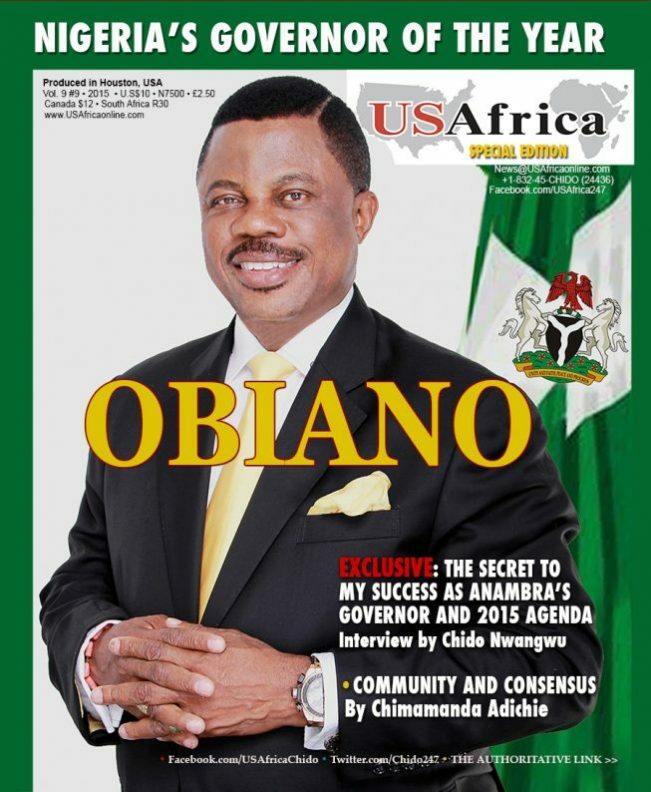 Obiano is on the cover of the January 2015 special edition of USAfrica magazine (attached) and has confirmed to USAfrica that he will attend the event for the award of Governor of the Year on Friday January 16, 2015, in Awka, Anambra State. On April 14 this year, the Anambra State Investment Promotion and Protection Agency (ANSIPPA) was established, has attracted investments and signed MoUs which the Anambra government has projected, in statements to USAfrica, at almost U.S$1.5 billion by January 2015. Realising that the people needed a drastic approach to several social and developmental issues confronting them, Governor Obiano had within four months of assumption began to tackle infrastructural decay, aggressively rolled out the caterpillars and engineering equipment to flag off a massive road construction network in the state, and addressed critical health, water and agricultural sectors, to name but a few. Similarly, in Nigeria, USAfrica also recognizes the commendable works of Governors Godswill Akpabio of Akwa Ibom and Babatunde Fashola of Lagos State. VIDEO #CNN special #CHIBOK Girls n #BokoHaram Live interview wt the Founder of USAfrica multimedia and public policy networks Chido Nwangwu. CNN anchors John Berman n Michaela Pereira. •Dr. Chido Nwangwu, moderator of the Achebe Colloquium (Governance, Security, and Peace in Africa) December 7-8, 2012 at Brown University in Rhode Island and former adviser on Africa business/issues to the Mayor of Houston, is the Founder & Publisher of Houston-based USAfrica multimedia networks since 1992, first African-owned, U.S-based newspaper published on the internet USAfricaonline.com; CLASSmagazine, AchebeBooks.com, the USAfrica-powered e-groups of AfricanChristians, Nigeria360 and the largest pictorial events megasite on the African diaspora www.PhotoWorks.TV . When God works a change in us He can others through us. Leon ibeka, you said it all. Good work is good work especially when it is evident regardless whether it is one day or one year. People must learn to abandon their negative reckless judgment of people ln power and for once acknowledge that which is good and promising. I read with both amusement and dismay the very few negative comments regarding USAfrica’s valid , factual and NEWS choice of the roundly acclaimed / performing Willie Obiano as the Governor of The Year 2014!. I have seen Obiano’s works especially the all important and UNEQUALLED RECORD ON SECURITY, first hand; agric farms, investments, etc and I STRONGLY COMMEND USAfrica for their excellent pick! Yes it is not too early to pick a man or any woman whose record rich first year ( 2014) is ending in only 4 weeks!!. 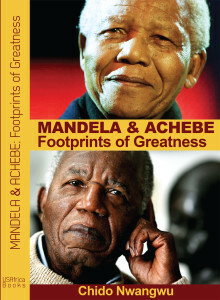 We should commend USAfrica’s Publisher for raising the bar and time of performance into the first year!!!. 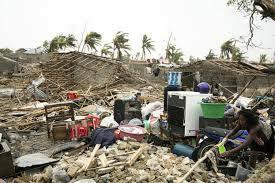 We want Governors who will ACHIEVE RESULTS , every year, and be recognized by credible media such as USAfrica!. Well done Dr. Chido for setting a higher standard!!!. @Cordelia Adaigbo Nwokocha made a very reckless comment by her baseless and malicious use of “Yellow Journalism”.She read ( or may be not) the USAfrica Governance Index and FACTS justifying the NEWS recognition as professionally summarized by USAfrica Publisher Dr. @Chido Nwangwu. I don’t think it is right for Cordelia to sit in front of her Keyboard in America and attack a first class multimedia executive who has been with USAfrica editors, reporters and researchers on ground in Anambra and across Nigeria and Africa! The guy did not even win the election. What kinda of work did he do in in 5m to deserve man of year. Na Wah for Naija. Am from ananbra,i know what you guys meant when it comes to security. After just about 5 months?, this is a job. Congratts but you just started we need more evidences. Carry Nwa Mama Willy na Ajasa. Experience Anambra now and see the difference; safety is not an issue. Follow me Governor Willie Obiano told Ndi Anambara! Even Jesus knew that he could not change the world alone. He called for help. Let the Anambara people lend him their helping hands.He will succeed! We are commanded to pray for all those in Leadership whether we approve of their accomplishments or not.We have to remember only God sets up Leaders and only Him can bring them down.Having said that we know no one can read the human mind,let us not be quick to throw the baby away with the bath water.There is always various routes to reach a destination.We are all unique ,no two are alike as designed by the Allwise God.I agree with Abraham Madu,that Dr Chido Nwangwu will never throw his weight behind a losing horse so paradventure as they will say if setting him on this Pedestal will always be an unspoken constant reminder for him to know that all eyes are on him and he can not afford to disappoint.Look at it this way when we have an unsaved one do we not unleash the Holy Spirit on them asking him not to give that loved one any rest until they turn their life around,have we not seem the Lord work on such individuals.Let us all I instead of negativity resort to fulfilling our part that is praying for him and his cabinet and the indigenes of that God proclaimed # 1 State it is not a coincidence that Anambra starts with the first letter of the alphabet.When we obey because God honors obedience we will see that the promises of God that never fails will manifest for God can turn the hearts of kings like a body of River and when that is done we will experience the reign of a Righteous King and the people will be happy.I see this honor as a reminder.Governor Obiano,and I pray God to give you grace to be able to rule God’s people in Spirit and in truth as judgement will always begin in God’s house,I pray for wisdom of Solomon, the patience of Job etc and to always seek the Father as Jesus did before ever embarking on anything and for the Lord to give you discernment to be able to differentiate right from wrong and having done this you will be able to stand and like Joshua have God success when BIBLE(Basic Instructions Before Leaving Earth) becomes your go to guide you can never go astray God bless the Governor and his cabinet to know to do,what to do and when to do Jesus mighty and powerful name I pray amen and amen!!! Chido Nwangwu mere ihe Igbo kwuru sị na eto onye ome, omekwa ọzọ. Igbo bụ Igbo hụrụ anya kweta na ọbụ ezigbo Gọvanọ. nile tinyere ọnụ n’ya bụ okwu. 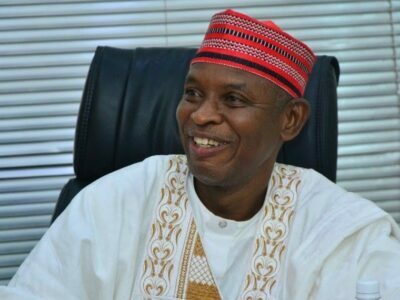 Best governor by what standard? . Please do not engage in yellow journalism because you have built a reputation among your readers. @ Chido Nwangwu, is it not too early to crown this man. He is not even up to a year in office and you are bestowing on him such praise. Why not allow him spend at least half of his tenure and assess him. The media has a way of praise singing Nigerian political leaders who eventually turn out to be a disappointment. Let’s thread with caution. Premature crowning! What has he done? Not even up to 6 months in office. This man is yet to face the torse and turns of public office. He has not even gone through a budget cycle, design and execute a passed budget. Can we please stay away from praise worship of political office holders till they prove their worth. 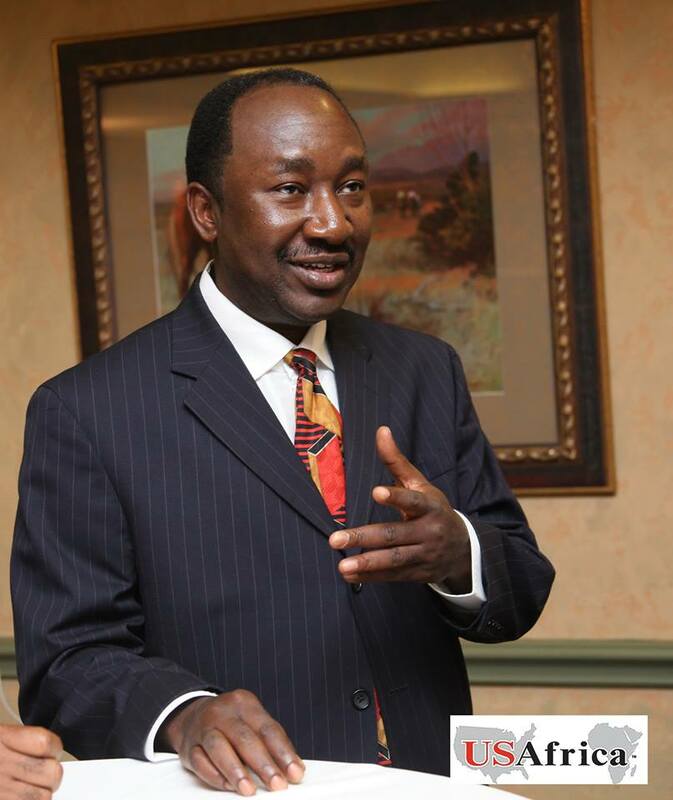 Best governor na emebeghi eme…when did he enter to hv acquired the best governor? Best gorvernor with the outgoing governors or the incoming ones, or has he forgotting his tenure should be counting with the incoming gov. Nawaooh. Phenomenal revelation in leadership by positive impact in Nigeria.